The late John Mihelic was one of those old style Southern music men – writer/arranger/producer/label owner – who may be best known for his work with rocker Mack Allen Smith. But from his Tupelo, MS base he made music in all kinds of styles, leasing out product when he could, putting it out on his own labels like Statue and Vee-Eight when he had to. From a soul point of view his main artist was probably Lloyd Hendricks, although tracks by Ann Bogus and Sonny Holley are well worth finding too. 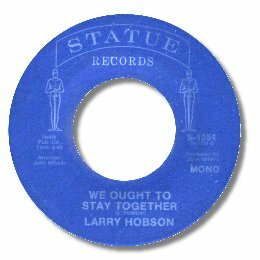 Mihelic cut a lot of white artists and Larry Hobson may well have been amongst them, but the feel of We Ought To Stay Together comes from Otis Redding and Bobby Bland. Over a dead slow chugging 12/8 beat, led by strong piano and bluesy guitar, Hobson begs and pleads with his woman. This is a powerhouse vocal, straight from the heart, and he takes his time trying to convince her not to leave. I’d guess this one dates from the early 70s judging by its length and stylings but it’s so obscure it hasn’t found its way into any reference book I know. If you listen closely from time to time you can hear another vocal track “bleeding” through – does this mean that there is another version of this wonderful deep cut out there? Note ~ A version of this track – which sounds identical to the one here – was included on the excellent CD “It’s A Deep Soul Thing Vol 4” under the name Larry Marshall.